Today marks the kick-off for the general conference and exhibition at IQPC’s annual cold chain conference in Chicago. Among all pharma events in the USA, this one features exhibits from pretty much anyone who is anyone in the pharmaceutical cold chain. Leading up to the event, Todd Keefe published an article in M2M Revolution where he cites that the demand for transporting medical and pharmaceutical products is exploding. He then states that there are significant challenges associated with moving time and temperature sensitive cargo in a way that keeps the cold chain intact, and ensures documented quality of delivery. One of those challenges relates to air cargo. Keefe writes: Pharmaceutical companies and shippers of perishable commodities need same-day service to move their wares around the country. Yet most of the active air transport containers (with compressors and active monitoring devices) are limited to wide-body aircraft, which are almost exclusively used today for international routes. So, as active refrigeration options from commercial carriers become harder to find (and likely more expensive) as wide body planes like 747s and 767s are shifted purely to international flights, what are the options? Keefe discusses a recent test project between Southwest Airlines, Cold Chain Technologies and Intelleflex. He writes that, at IQPC: Cold Chain Technologies is showcasing a new reusable packaging system that combines vacuum insulated panels, refrigerant materials, and embedded RFID temperature tags from Intelleflex that can maintain a 2°-8°C internal temperature for up to 120 hours. This type of packaging, when combined with a flight schedule such as Southwest Airlines Cargo’s 3,300 daily nonstop flights, gives shippers a number of options for moving temperature sensitive cargo anywhere in the United States in a matter of hours. I agree. The option of utilizing a major air carrier’s massive flight schedule to successfully and safely ship temperature sensitive pharmaceuticals across the USA provides a new option for cold chain logistics. Keefe then describes the project: Cold Chain Technologies, Intelleflex and Southwest validated the solution last month with a pharmaceutical test package that traveled between Dallas, Austin, Los Angeles, and San Jose. The time of the journey was six hours and 20 minutes, including time spent in the cargo holds and on the tarmac moving from plane to plane. The external temperature ranged from 78° F to 89° F, yet the internal temperature of the package (which was read repeatedly) remained between 2° and 4° C. The test showed how shipments that need to be maintained between 2°-8°C can be easily shipped with proper temperature management via Southwest Airlines. You can see these products on the show floor at IQPC today and tomorrow. 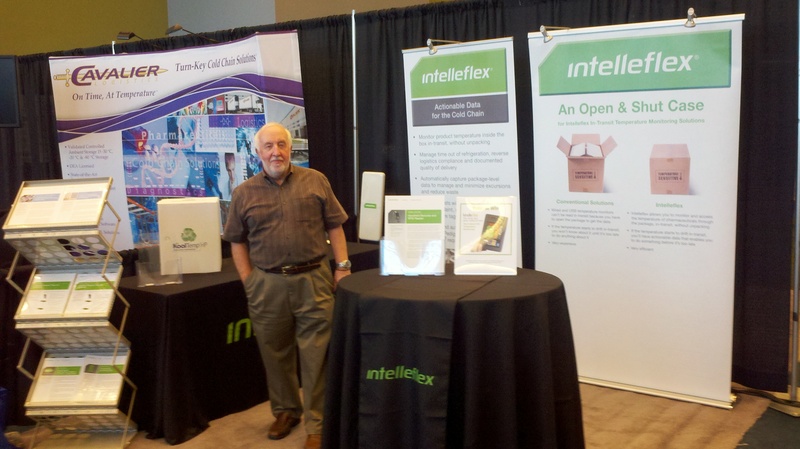 Visit us at Intelleflex at booth 40. I hope to meet you there! This entry was posted in Pharmaceuticals, RFID Tags and tagged Cold Chain Technologies, IQPC, Southwest Airlines. Bookmark the permalink. Ref: Southwest Airlines, Cold Chain Technologies and Intelleflex. ***The San Jose Foreign Trade Zone+San Jose International Airport/Airfreight Systems is an excellent site for Clinical Materials Supply Chain Mngt Services between San Jose/Silicon Valley & Europe/Asia-India.